Two days a week, no civilians on Udhampur-Baramulla NH. In a decision that has been described as “draconian” by mainstream parties in the Valley, the J&K government has banned civilian traffic from dawn to dusk for two days every week until May 31 on the 270-km national highway stretch from Udhampur in Jammu to Baramulla in Kashmir to facilitate the movement of security convoys. 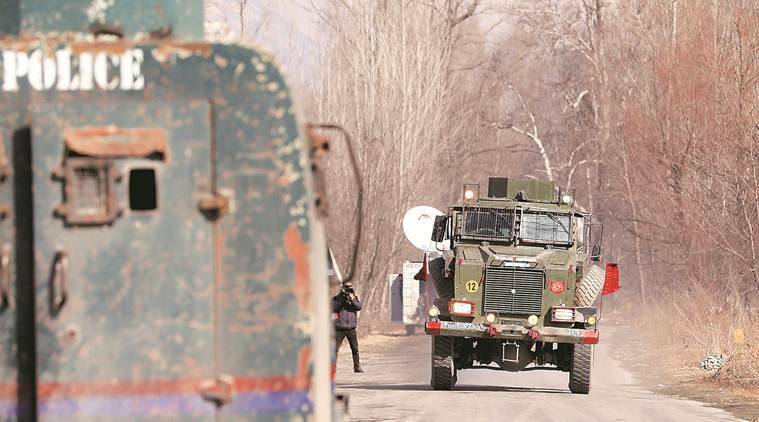 The move to enforce a virtual lockdown every Sunday and Wednesday comes almost a month after a suicide bomber rammed a car laden with explosives on a CRPF convoy along this key arterial stretch in Pulwama on February 14, when 40 security personnel were killed. Speaking to The Indian Express, Peoples Democratic Party chief and former Chief Minister Mehbooba Mufti said the move “will cause a lot of inconvenience to people”. “We have only one lifeline and that is this highway. If you close it for civilian traffic for two days in a week you can imagine what would be its consequences. We are living in a democracy, we are not living in a military state. How can they do this?” she said. National Conference vice-president and former Chief Minister Omar Abdullah posted on Twitter that the decision is a “shocker” and a “glaring admission of failure to manage the internal security of J&K”. This is the first time the Government has made a key highway — linking Kashmir to the country — out of bounds to the local population. From schoolchildren to patients, marriages to funerals, all will need to use circuitous routes. Seen as “collective punishment,” it will add to local resentment in the run-up to elections. “Patients will not be able to reach hospitals, students will be deprived access to schools, employees won’t be able to reach work and the list goes on & on. There has to be a better, less people unfriendly way of protecting forces using the highway,” he posted. Peoples Conference president Sajad Lone described the decision as “disastrous”. “I am still in wonderment whether this order is actually true. This is a first of its kind. In the civilised world, military needs are always subservient to civil needs. It will have disastrous economic, social and political consequences,” he said. Claiming that the decision was a move “to mitigate the inconvenience to the civilians”, the government said it has “notified two dedicated days in a week, i.e, Sunday and Wednesday, exclusively for movement of security forces convoys and there would be a complete ban on civilian traffic on the National Highway during these two days from 4 am to 5 pm”. The order says the government would “evolve necessary” measures for emergencies during this period. “The government has further decided that in the event of any requirement for local traffic movement for any emergency or for other purpose, the local administration and police would evolve necessary procedures for this, as is done during curfew days,” it said. During his visit to Kashmir after the Pulwama attack, Union Home Minister Rajnath Singh had said that no civilian traffic would be allowed during the movement of security convoys. Since then, security forces had been stopping civilian traffic for 15-30 minutes during the movement of convoys. The government order comes four days after a car exploded near a CRPF vehicle in Banihal. On Monday, J&K Police said they had arrested Owais Amin (20), who allegedly drove the car, and recovered two improvised explosive devices (IED).